Ahhhh. I hate this. The television series was only half-hour long episodes and only 11 at that. Do you know how many manga volumes there are? Actually…I’m not sure on the final volume count…but there’s like 83 chapters. So much was left out that I would have liked to see. Sniffle. I must say that I would like another movie or a special to complete the story. This movie basically combines two different stories into one. The first story of the Ouran Battle happened earlier in the series and was a lot more intensive than what was actually shown, the second story was from more of the middle and stayed fairly true to the plot, but like always, there are some changes. It has been half a year since Haruhi has been masquerading as a male and has been in the Host Club. Tamaki and company are still amazed at her lack of ambition and gumption. She doesn’t like taking on the elaborate role play and only cares to sit quietly and drink tea with the female guests. Haruhi is then asked how she came to join the club. She talks about the debt, but Kyoya jumps in and covers her mouth with his hand. 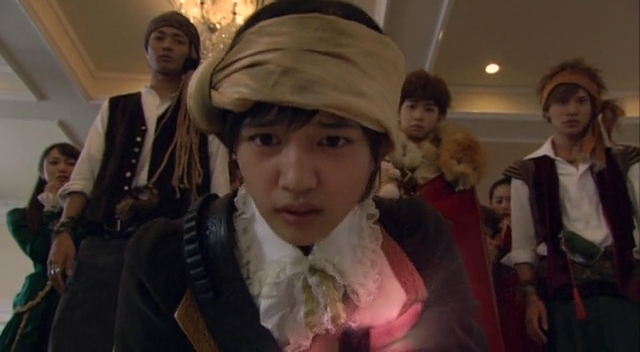 I must says that Daito Shunsuke’s play on Kyoya this time around is a bit different. 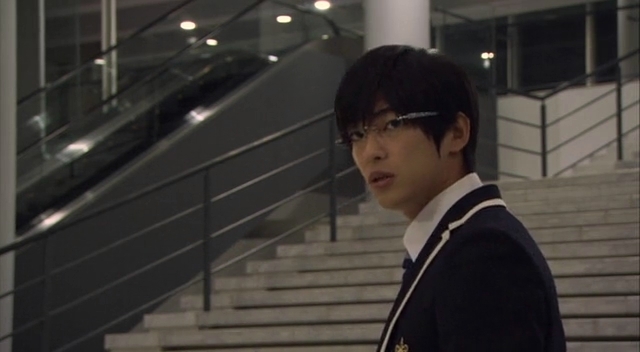 Kyoya was never as Zany as Tamaki, but he is portrayed that way at times in this movie. We then get a voice over from Haruhi talking about how she ended up at the club followed by various scenes from the television series. At this time, and new transfer student arrives by the name of Michelle Monaru [Shinoda Mariko of AKB48 fame]. Tamaki is immediately attentive to her. Kyoya, knowing Michelle’s background, doesn’t think it’s bad to become her acquaintance. Kyoya and Tamaki then cater to the girl’s every whim, much to the surprise and annoyance of the other host club members…well Kaoru and Hikaru are more annoyed while the sempais Mori and Honey just kind of do what they always do—quietly observe. You know…there really isn’t much to say about this movie. The plot is split between Michelle’s motives for coming to Ouran, preparing for the battle, and the members discovering their true feelings. I love how Haruhi is so clueless to the fact that she loves Tamaki and thinks its just a weird cold. Her father understands, but won’t tell her. It’s not until one of the black magic club members gives Haruhi a girl’s magazine with a quiz in it that Haruhi comes to the staggering realization that she likes Tamaki. And Tamaki… is a brainless idiot as always. Because he doesn’t want to confront his real feelings, he keeps trying to rationalize his affection for Haruhi being his daughter. Sigh. At this time we get some twin insight. I thought we had pretty much got this all out of the way when the series ended, but I guess not. Haruhi has a heart-to-heart with Kaoru. She knows that while the twins may seem the same, they are different with their own personalities. Kaoru is nicer and gentler. What happens if there is something that the twins cannot possibly share? Kaoru replies he will give it up for Hikaru. Haruhi warns Kaoru that will hurt both him and Hikaru in the end. It’s true. I won’t talk much about the Ouran Battle. I mean, it’s a fun plot, but sooo backburner it’s not funny even though it’s a very important event for all Ouran clubs in order to get the coveted central salon and it brings in a childhood rivalry between Kyoya and the head of the American football club that’s amusing to watch. Plus, you get to see the black magic club do black magic that works. Go figure. Michelle is at Ouran to align herself with the Suou family in order to help her brother who is having business issues. Michelle had a rather strict upbringing even though she comes from a wealthy family, so she tells all kinds of lies and puts on all kinds of airs. Tamaki and Kyoya both know this, but cater to her anyways. Tamaki wishes to bring out Michelle’s lost real smile (she also reminds him of his mother as they look similar) while Kyoya works on brokering a deal with her brother (using his father’s name of course). When Michelle’s plan fails, she blames Tamaki’s affection for Haruhi. The two wind up at a staircase in the rain and Haruhi is accidentally (yes, it was an accident) pushed down the stairs by Michelle and Tamaki throws himself after her to cushion the fall, thus landing him in the hospital. After the stair incident, Grandma Suou takes charge and says she will sever all business ties with Michelle’s family (her way of showing her love for her grandson even if she keeps denying that she does care). 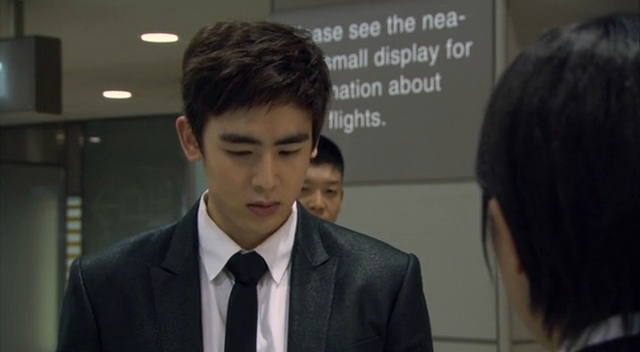 This leads to an angry call from her brother Lawrence [2PM’s Nickhun]. This hurts Michelle. Haruhi tries to talk over what happened and the girl says everything is too late to rectify. Haruhi goes to the school and looks for Michelle’s precious lost book and discovers that it’s full of recipes—meals she wishes to cook and eat with her brother who has been too busy to show any attention to his lonely little sister (their parents died three years ago). Haruhi then goes to the club and decides to help Michelle. The club are united as a team and family once more, putting aside the feelings and jealousy that was beginning to arise. They promise to win the battle and show Michelle you can say your heart to the person you love most. While the other teams search for the hidden treasure of Michelle’s, the host club run off to the airport to pick up Lawrence who flew to Japan on business. The time ends and the club arrive with Michelle’s older brother and a large bento full of all the foods she wanted to eat with him. It’s a tearful reunion and Lawrence vows to never let his sister be lonely like that again. Ah…Nickhun. His acting wasn’t bad, but could use some improvement. Still…he did good for his first acting role. Thus, Michelle declares the Host Club the winners since her brother was her real treasure. We end with the club members seeing the siblings off as they go back to Singapore. Haruhi sort of confesses her feelings. Well… she and Tamaki discuss that they have dreams that they want to pursue. Haruhi feels that until she has caught up to Tamaki and realized her dream, she won’t confess. The two then end up sharing an accidental kiss. When Tamaki talks about being her father again, Haruhi calls him an idiot and he goes flying into the water for all the other club members to admire. We then end at the central salon and the host club members celebrating their victory. Kaoru was going to give way to Hikaru, but Hikaru cuts him off and says that while he likes Haruhi, he likes Tamaki as well. So basically, the two just agree to stay together with the host club to keep being with the two. Honey and Mori confront Kyoya about his real intentions and while Kyoya is still looking out for his own good, he’s found something precious he can’t replace and he won’t do anything to hurt that. And that’s it. See? Doesn’t it seem more like a special? And while there is a tad more resolution than what we could see from the drama, there is still a lot left hanging. I mean… the manga has ended. Couldn’t they have given us the ending-ending? Oh well. I did enjoy the movie since I love everything OHSHC related. I have the anime, the drama, I have like the first 9-10 volumes of the manga. It’s just a great series full of funny side stories and characters and follows the evolution of each character. It’s a great teenage slice of life. Yeah they might’ve well just made this into 2 drama SP’s. I think they could’ve attempted to at least make it more of a movie-quality and give us an epic storyline. Wait, so the live action hasn’t covered the Tamaki-arranged-marriage plot yet, right? I thought they would do this part in the movie..
Nope, they didn’t cover that at all. Like I said, it was splicing together two different story arcs from the beginning and middle of the manga series. I was a bit disappointed by this. I was waiting for the movie and it was more like an SP. I was waiting for more of the storyline of the later half of the manga, but didn’t get it. It was sad. I mean, it’s still good, but…they could have done things a lot differently I think. Yeah nothing is really resolved, they might as well have another season or something. There is just way too much for them to cram into a single season & a movie. Yeah, it was definitely just like an extended episode or special. I guess that’s how they filmed it so quickly though, lol. I swear, they announced they were making a movie, and then it felt like it was released a month later. Nichkhun… i’m wondering if it was his acting that was so bad, or the fact that he had to speak slowly because he was speaking in English (which i really hate. The audience can’t understand them anyway, and they have subtitles, so why do they still need to speak slowly?). Like, if he was in a Korean or Chinese drama, and just speaking naturally, would he be better? Lol, probably not. But i’d watch him in anything because i’m terrible biased… But i didn’t understand why he was cast in that role at all. Was he supposed to be Japanese? Ah, don’t you love an accidental kiss. I did like it that Haruhi at least acknowledges her feelings, even though she’s not ready to confess them yet. Tamaki is still in denial, so she’s a step ahead of him. I thought they’d dealt with the twins in the show as well. This was just a rehash of what we’d already heard. Well, Koreans are getting exported to movies all over now. We got all these idols and actors doing movie and dramas in China, Japan, and Taiwan, so it’s not surprising Nickhun was cast in the role if you look at that. Ah, accidental kiss. I thought in the manga that Haruhi and Tamaki realized their feelings around the same time, but due to circumstance, they both decided to not express themselves to each other yet, but they have Haruhi figuring it out here with Tamaki only thinking he’s a perverted “father.” Sigh. I hate when they go back and do recaps in movies and SPs. Let’s just pretend everyone has seen the series already and skip all the unnecessary stuff, shall we? I haven’t watched the ATARU SP, but one of the subbers at SARS says that it’s mostly a recap with not a whole lot of new plot. That makes me sad. I think their manga discovery was closer to the same time. Haruhi hid her feelings to pursue her dream and Tamaki hid his because of his grandmother’s intervention. Yes, the two are pretty slow, but it make sense given their characters’ personalities. I looove Ouran, but drama movie sequels, and even TV specials, pretty much never resolve anything. They always lose their heads and forget what made the show so fun, or just rehash the final conflict without any resolution… again. I’ve pretty much given up on seeing new plot stuff in the specials, and use it spend more time with the characters, who could be doing anything and I’d watch. So as far as that goes, it was a blast. And I’m glad Haruhi’s dad made an appearance, too, because he is amaaaazing. As far as the acting in English… bleeech. I see this in pretty much every Asian thing I watch, even with native English speakers, that the lines always sound stilted. I guess it’s a combination of the writing of the lines, and if the person directing it can’t speak the language, it’s a bit more difficult to get it to sound natural. Overall, I would have liked way less time spent on the Michelle plot, and way more with the Host Club peeps. I thought they were setting it up to be like the last two episodes of the anime (I haven’t finished reading the manga yet, but there’s probably something similar there, too), and it would have been better if Michelle were at least more of a threat. Still, it was fun, and I guess they’re leaving it open on the off chance they get to do something else with it. Here’s hoping! Yes, I totally agree. The same can be said of sequels or continuations in the broad sense. Continuations can’t live up to the originals. Not that this was bad. It was an amalgamation of two or three plots from the manga. Not necessarily any of the plots I was hoping for, but at least Haruhi realized her feelings. And, yes, I was happy to see her dad. The actor does an amazing job. Yes, English in dramas is either way stilted and unnatural (even for Native speakers) or its done by English speakers who can’t act. I generally cringe at English in dramas. But there are times the absurdity makes me laugh. Ah, Engrish. So much fun. Like I said, this seemed more like a TV special than a movie and it wasn’t bad. It was a cute little continuation of the drama, but they covered things already wrapped up with the ending of the series, so that was a little disappointing to spend time rehashing what had already been done well before. I would have really enjoyed seeing the boss show up. He was soooo cute when he discovered Haruhi was a girl and vowed to keep her secret forever. They didn’t have enough time to cover the major events that led up to the manga’s conclusion, so its understandable we couldn’t get to see Haruhi and Tamaki together just yet. I actually rather enjoyed the movie (probably because I missed seeing everyone), but I will say that it lacked closure. I definitely feel like it would have been better off as a TV special…I was hoping for more, I guess. Exactly! It was good…but yet so disappointing for its lack of closure and basically summarizing relationship issues which were technically cleared up by the end of the the series. 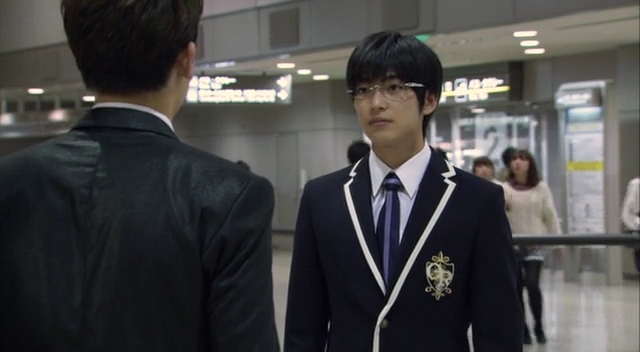 Meaning we all knew the twins and Kyoya liked Haruhi, so why did we rehash again?